Someone was watching over me today. You may have noticed my freak out below, but well, everything may be okay after all. I mentioned previously that I called VW USA to discuss the problem with a customer service rep. The lady that I talked to was incredible. She was empathetic, she listened to me, she sympathized and she noted that if this were her own daughter, she wouldn't know how to handle the situation. You may also remember that she mentioned that I shouldn't get my hopes up, but that she would call me soon. When she called me back she said, "I am so happy that you called me today. I have some good news." Apparently, when I bought the car, it still had it's original warranty. Additionally, when I bought the car used, it had a two year warranty (apparently in addition to the regular warranty). I don't know, it all seems very confusing, but she somehow figured out how to ensure that my vehicle was under warranty until July 2009. I still don't understand it, but I could drive there and kiss this lady. She told me that she called my mechanic already to tell him the news. I called him later to confirm and he was a d-bag, as per usual. He said that when he checked the warranty, nothing came up the first two times, but that the lady told him the news. He said that it was "100% not his fault" and that he would talk to the transmission specialist tomorrow about this. Cross your fingers and say a little prayer for me tonight. I think everything may work out. 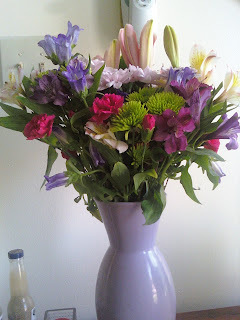 Oh, and look at the beautiful flowers that boyfriend brought me today. What a sweetie. Yay the car great spirit in the sky likes you!! That is GREAT news! When I read your previous post I was very worried. So glad things turned around and the flowers are beautiful. What a nice boyfriend! Thanks for the support guys! This week has been a seriously emotional roller coaster ride. I was so worried as well! Hey, I'm glad that things seem to be working out. I'm crossing my fingers for you. I hope you never plan to go to that particular dealership again (I now you won't, duh). And if you haven't already in your previous conversations with VW USA --- report their pathetic excuse for "service" to any & everyone on the food chain you can get ahold of. You really got jerked around by those people. YAY, YAY, YAY! =) Just remember.. karma! He was a d-bag to you, probably is always a d-bag, and he'll get what's coming to him! And.. boyfriend is AWESOME! How thoughtful! Bonus points for sure.